Having diabetes (high blood sugar levels) increases the chances of plaque formation in the arteries of the heart thereby narrowing them thus leading to arteriosclerosis. This leads to high blood pressure and if left untreated causes various heart problems and that’s why high blood pressure is termed as ‘silent killer’. In this situation controlling blood sugar and blood pressure both within the required limits should be the priority. This can be achieved by maintaining healthy diet along with the necessary salt restriction and following a good exercise regime under your doctor’s supervision. What to eat for people with diabetes and blood pressure? 1. Eat small and frequent meals wisely to avoid fluctuations in blood sugar levels. 2. Limit the intake of carbs in each meal. Try and have some high fiber recipes such as Mini Carrot and Cabbage Buckwheat Pancake instead as these will help control arterial blood pressure. 3. Avoid the salt on table and monitor its use in cooking. Turn to herbs for added flavour. Masala Stuffed Parota – the healthier version of classic Bengali recipes is just the perfect example to justify this. 4. Say ‘No’ to processed ad refined foods. Your healthy fare should include Oats Flax Seeds Roti, Baked Buckwheat Puri etc. which are cooked with healthy grains like oats, barley, buckwheat etc. 5. Restrict starchy veggies like potato, yam, purple yam etc occasionally in your cooking. Fill you your plate with potassium rich veggies like cabbage, mushrooms, carrots, tomatoes, cauliflower, ladies finger etc. One Meal Soup which has restricted amount of salt is definitely a nourishing portion. 6. Have more broccoli : Broccoli contains sulforaphane which can significantly improve high blood pressure. Being low in sodium, it can be safely consumed by hypertensive individuals. 8. Fruits which have a high glycemic index like mango, chickoo, banana, custard apple and grapes are best avoided to prevent spike in blood sugar levels. 9. Switch to low fat dairy products, especially if you need to control weight. Make use of low fat curds and low fat paneer in your cooking. Serve you parathas with low-fat curd or use low-fat paneer. Whip up healthy Indian diabetic desserts like Paneer Kheer. 10. Avoid the excess use of oil. Cook using low-fat methods like baking and sautéing. 11. Stay steer off mithais, chocolates, puddings, cakes, ice-cream and similar types of desserts. You can try our tried and tested dessert Strawberry Oats Pudding in small amounts once in a while to please your palate. 12. Read the labels carefully when buying ready-to-eat and canned foods. These contain excessive sodium which isn’t a healthy choice for hypertension at all. 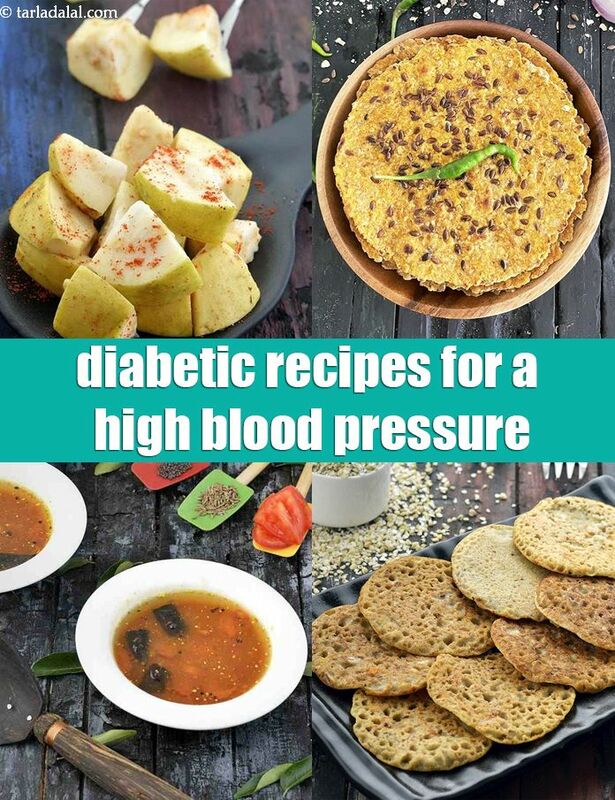 Enjoy our recipes for people with Diabetes and Blood Pressure and related Diabetes articles below.